Matrix metalloproteinases (MMPs) are zinc- and calciumdependent proteolytic enzymes. 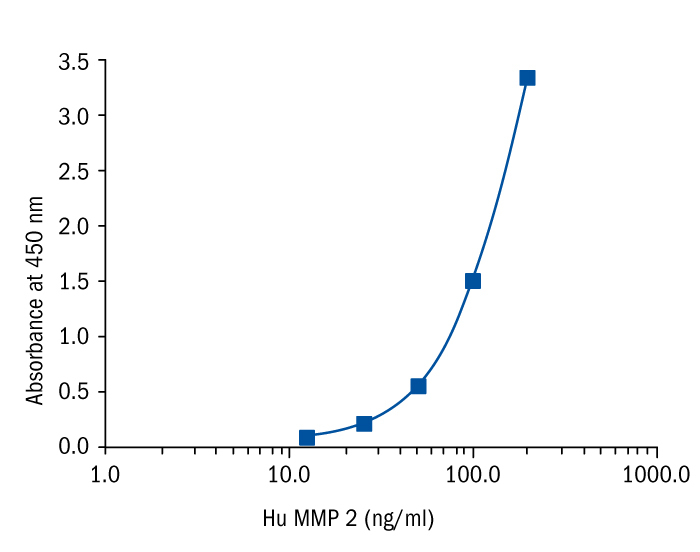 MMPs can digest extracellular matrix proteins, such as collagen and fibronectin, and many other proteins, such as proteinases, growth factors, cytokines, chemokines, and cell receptors and thus regulate their activities. MMP was first identified in 1962, and since then, other MMPs have been identified. Interestingly, whereas many MMPs are secreted by cells, others are anchored on cellular membranes. Members of this family play important roles in various cellular processes, such as migration, differentiation, and proliferation. Furthermore, they have been associated with pathophysiologies of various diseases, such as cancer, atherosclerosis, and arthritis. MMP2 (matrix metallopeptidase 2 (gelatinase A, 72kDa gelatinase, 72kDa type IV collagenase)) is a protein-coding gene. MMP2 codes for a gelatinase that cleaves type IV collagen, a major component of basement membrane. Elevated expression of MMP-2, along with MMP-9 is usually seen in invasive and highly tumorigenic cancers such as colorectal tumors, gastric carcinoma, pancreatic carcinoma, breast cancer, oral cancer, melanoma, malignant gliomas, Chondrosarcoma, gastrointestinal adenocarcinoma. Levels are also increased in malignant astrocytomas, carcinomatous meningitis, and brain metastases.